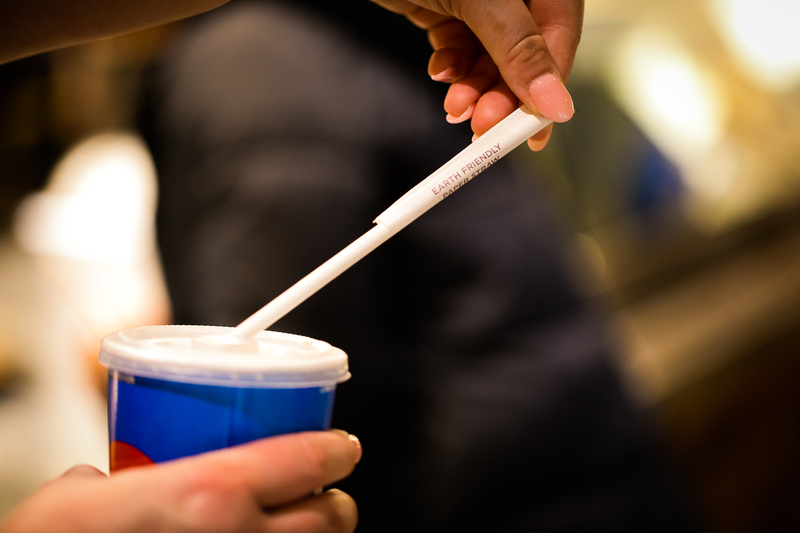 Plastic drinking straws and carry-out food bags are history at Sacramento State and throughout the 23-campus California State University (CSU). A policy adopted in December by the Chancellor’s Office and effective Jan. 1 bans the plastic, single-use items. The move comes as the CSU aligns itself with state policies and strengthens its position as a worldwide leader in sustainability practices. Further, all CSU campuses must eliminate Styrofoam food-service items by Jan. 1, 2021, and discontinue sales and distribution of single-use plastic water bottles before Jan. 1, 2023, or upon contract renewal, depending upon existing contract terms. “Beyond the specific products mentioned, the policy is meant to encourage and support campuses’ efforts to phase out a wider array of single-use plastic items, which make up a significant proportion of the waste campuses send to landfills,” according to a statement issued by Chancellor Timothy P. White’s office. Single-use plastic products, typically discarded within minutes of use, take hundreds of years to decompose, whether in landfills or elsewhere in the environment. The Great Pacific Garbage Patch, in the Pacific Ocean between California and Hawaii, is the world’s largest accumulation of ocean plastic – approximately twice the size of Texas. According to oceancleanup.com, the 1.8 trillion pieces of spinning plastic weigh about 80 tons. Most of the trash in the Great Pacific Garbage Patch is not biodegradable. It simply breaks in smaller pieces, putting marine life and humans in peril. Much of the microplastic debris is plastic bags, bottle caps, plastic water bottles, and Styrofoam cups. In September 2018, then-Gov. Jerry Brown signed Assembly Bill 1884, which requires full-service restaurants to provide plastic straws by customer request. Fast-food eateries are exempt. During the Fall 2018 semester, Sac State introduced paper drinking straws at several campus eateries, including the Servery at the Dining Commons, Courtyard Market, and Epicure restaurant. Plastic bags weren’t widely used on campus. “We have been working with University Enterprises, Inc. (UEI) Dining Services on campus to move away from plastics and Styrofoam and adopt a ‘wash and reuse’ program with a reusable meal container and insulated drink container made from recycled paper,” says John Guion, Sac State’s senior director for procurement and contract services.